Do you need to customize MEMS sensors to your application requirements? Do you need to integrate MEMS sensors with other components? Do you have a need to work more closely with your MEMS sensors supplier and/or MEMS foundry? Our presentation will introduce a new, more efficient way of addressing these challenges! 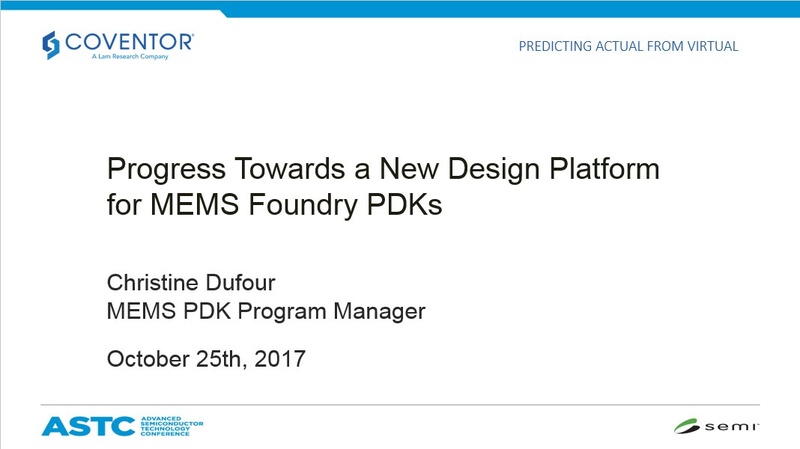 "Progress Towards a New Design Platform for MEMS Foundry PDKs"
Our MEMS PDK Program Manager, Christine Dufour, will disucss trends in the MEMS sensor market that are driving demands for increasing customization and integration. It will then introduce a new platform for MEMS sensor design & integration with support for process design kits (PDKs). This new platform will help address the need to design and produce customized sensors, faster and less expensively than in the past. Christine Dufour has more than 20 years of experience in the Semiconductors industry, leading Process Design Kit development for BiCMOS and CMOS processes in several major semiconductor companies. Christine has also worked as a Product Manager in the RF design environment area. She has extensive experience in PDK development and all aspects of design flow and design tools.